Events ranging in size from 150 to 600 people may be held in the multiple ballrooms, including the hotel’s expansive lobby area. 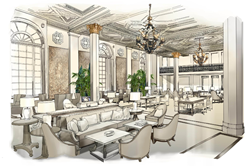 “The ballrooms were originally created in the roaring 20s, and I can imagine the grand celebrations people must have hosted there,” said Ed Riley, hotel developer and leader of the project to restore the hotel to its former beauty. " Central New York’s newly engaged couples now have a new romantic venue option to consider for their weddings when the Marriott Syracuse Downtown – formerly the Hotel Syracuse – opens in Summer 2016 (https://www.marriottsyracusedowntown.com/weddings/). The historic icon, affectionately known as the “Grand Dame of Central New York” is nearing the final stages of its $70 million dollar restoration and is booking events as early as July 2016. 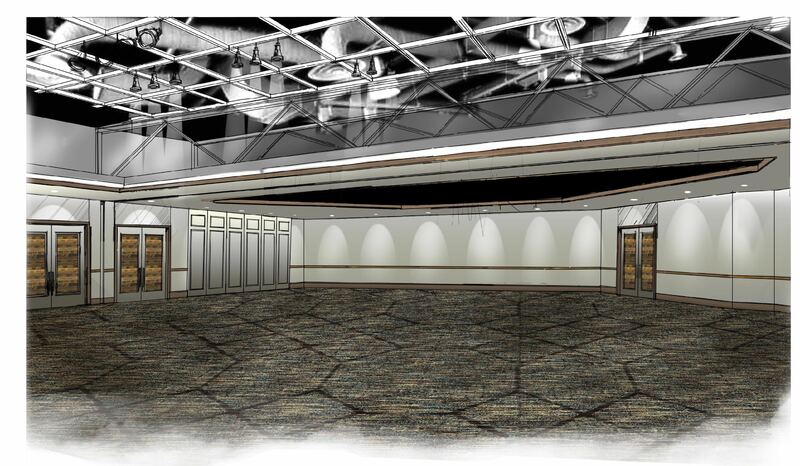 Featuring two locally recognizable historic ballrooms – the Grand Ballroom and Persian Terrace – the Marriott Syracuse Downtown will have over 41,000 square feet of flexible function space. Events ranging in size from 150 to 600 people may be held in the multiple ballrooms and pre-function spaces, including the hotel’s expansive lobby area. When it opened in 1924, the Hotel Syracuse was the gem and cultural center of downtown Syracuse. With the assistance of the Syracuse Industrial Development Agency, Riley purchased the hotel in 2014, and is restoring the hotel to its original grandeur. In 2015, Riley entered into a licensing agreement with Marriott International and selected nationally renowned operator Crescent Hotels & Resorts as its manager, thus changing the hotel’s name from Hotel Syracuse to Marriott Syracuse Downtown. The grandeur of the hotel greets guests from the moment they enter its expansive lobby area with its 20-foot columns, terrazzo floors, ceiling and wall murals, and restored original 1924 chandeliers. Multiple ballrooms and event spaces are available to host weddings and events of any size. The Finger Lakes Ballroom (formerly the Imperial Ballroom) represents a more modern era with its contemporary, yet elegant, décor. This ballroom can accommodate up to 600 people comfortably and offers a variety of options to customize events to desired specifications. Recalling the elegance and romance of a bygone era, the historic Grand Ballroom seats up to 500 people. The enchanting balconies, floor-to-ceiling windows, crystal chandeliers and original hand-laid wood floors set the stage for every bride’s vision of herself as Cinderella as she awaits her Prince Charming. Adjoining the Grand Ballroom is a unique “Bride’s Room” that allows for pre-wedding ceremony or reception dressing areas, as well as a private location for still and video wedding photography. The Persian Terrace commands attention with its unique architectural details including softly arched windows, stately columns, hand-painted ceiling murals, a customized stage area, and a hand-laid wood dance floor. Accommodating up to 300 people, the Persian Terrace creates an intimate and formal setting for wedding ceremonies, receptions, and other social events. In addition to the ballrooms, the art deco Rainbow Lounge and Cavalier Room are perfect locations for pre or post-event cocktails and dinners. Each wedding couple will work with an experienced in-house event specialist to customize the wedding of their dreams. From location to menu selections, and guest accommodations, the talented Marriott Syracuse Downtown catering team will create a personal and memorable experience. Wedding guests will love the history, romance and charm of the Marriott Syracuse Downtown. In its heyday, the hotel was a hot spot for celebrities, politicians and important public figures. Some of the high-profile guests included President John F. Kennedy, President Dwight D. Eisenhower, Elvis Presley, Bob Hope, Charles Lindbergh and John Lennon. In addition, the restoration team has uncovered hidden gems, such as an iconic barbershop, covered-over windows and balconies, and the original art deco terrazzo floors of the Rainbow Lounge, which were thought lost when the once-popular cocktail bar – known for refusing to serve “unescorted women” until the late 1960s – became a sports bar in the 1990s. For more information or to inquire about reservations, please visit http://www.marriottsyracusedowntown.com or call (315) 474-2424. The Marriott Syracuse Downtown (formerly Hotel Syracuse) is a historic hotel originally opened in 1924, located at 100 East Onondaga Street, Syracuse, New York. 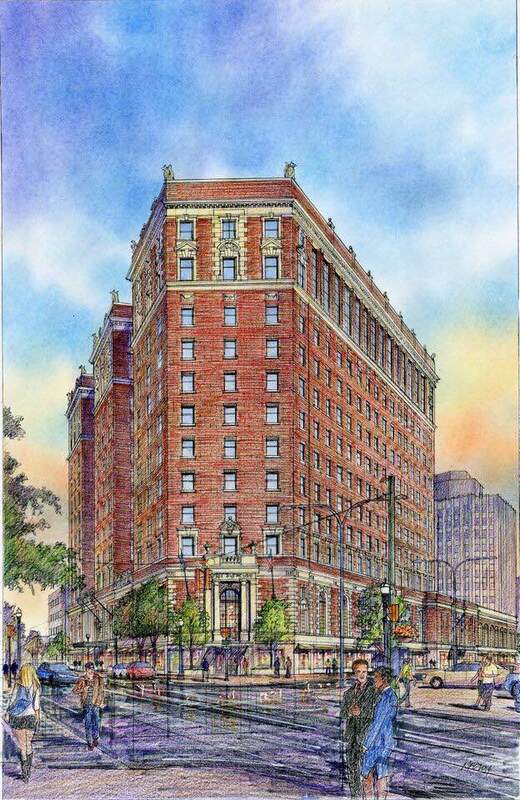 The hotel closed in 2004, and now the Hotel Syracuse Restoration Company is renovating the property to integrate the landmark’s historical components with modern amenities – providing a unique, upscale experience for business and leisure travelers as well as a new local venue for corporate meetings, weddings and social events including a community meeting room for use by local non-profits. The hotel is also the official headquarters hotel for the Onondaga County Convention Center. The property will have 261 guest rooms, over 41,000 square feet of flexible meeting, wedding, and event space including a completely modernized Finger Lakes Ballroom, two historic ballrooms, five distinctive in-house restaurants and bars, and eight meeting spaces designed to adhere to IACC’s strict requirements. The Hotel Syracuse restoration team is dedicated to preserving the memories of the City of Syracuse’s past while creating a vision for the future. For more information, please visit http://www.MarriottSyracuseDowntown.com. Crescent Hotels & Resorts is a nationally recognized, top-3 operator of premiere hotels and resorts. Crescent currently operates over 100 hotels and resorts in the US and Canada. Crescent is an award winning Marriott operator, having been awarded Marriott’s most prestigious award, the Partnership Circle Award and is one of the few elite management companies approved to operate upper-upscale and luxury hotels under the brand families of Marriott, Hilton, Starwood, Hyatt and IHG. Crescent also operates a collection of legendary independent hotels and resorts. Crescent’s clients are made up of hotel REITs, private equity firms and major developers. For more information, please visit http://www.chrco.com. Marriott Syracuse DowntownExterior Rendering The Finger Lakes BallroomRepresents a more modern era with its contemporary, yet elegant, décor.